Fifty years after its 1964 debut on Broadway, Fiddler on the Roof continues to be an audience favorite (book by Joseph Stein, lyrics by Sheldon Harnick, and music by Jerry Bock). Under the direction of Scot Charles Anderson, and with music directors Mark and Nancy Press, Seattle Musical Theatre (SMT) celebrated the many communities that Fiddler has brought together in a manner reflective of Anatevka’s own tight-knit community spirit: anyone who had ever been involved with a production of the musical was offered a special $10 entry to their opening night. The continual zeal that is shown for this musicalis made more noteworthy by its historically specific setting. Located in early 1900s Imperial Russia on the Pale of Settlement, to which Jewish residency was then confined, Fiddler illuminates the violence and persecution faced by the small village of Anatevka. For Anatevka’s inhabitants, life would be “as shaky as a fiddler on the roof” if it weren’t for the traditions that stabilize them. While everything that he is used to changes, Tevye must decide which traditions are too sacred to give up; and it is this that makes the musical hyper-relevant to out increasingly quickly changing 21st century. Warm and jocular, Fiddler on the Roof likely has another 50 years of performance in its future. 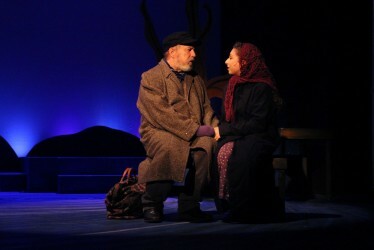 SMT’s own production of Fiddler, led by longtime Seattle actor Larry Albert as Tevye, was strong. For those who were able to catch Village Theatre’s production of the musical during the 2012 season, Albert’s representation may initially be a little disappointing: compared to the more robust one of Eric Polani Jensen, Albert’s movement initially seems a bit too sluggish. Within the first couple scenes, however, this begins to work for Albert’s own portrayal of Tevye as particularly drained from overwork and reconciled (though firm in his faith and tradition) to the changing ways. If not as spirited a Tevye as we have ever seen, Albert is certainly an endearing one. Daina Goldenberg also excels as Hodel, and her remarkably beautiful voice makes the scene at the train station (Act 2, Scene 3) that much more moving, even if she does block Albert from view during part of her song. Issues with static from the microphones, persistent throughout the first act, are largely resolved during the latter half of the show. Fiddler on the Roof at Seattle Musical Theatre (7120 62nd NE, located in Magnuson Park) runs through November 23rd. 7:30pm Fri-Sat, 2pm Sun. Tickets ($20-$35) are available at www.seattlemusicaltheatre.org.